Papertrey Ink January Blog Hop. scrap paper then stamped it on my panel. pretty awesome using it on the vellum *wink*. 4. After all my images are stamped, I then feed it to the sewing machine to get some stitches. 5. Lastly I die-cut the Words Wonderful Thank You die on gold foil 3 times to then adhere, to get the raised look. I hope you enjoyed my take. Have a Wonderful day creating. GOrgeous Joni!!! I love the way you masked the card off and added leaves, the design is wonderful!! The colors are just too gorgeous. I LOVE your vellum leaves... Beautifully done, Joni! This is absolutely stunning. I gasped when I saw it. Definitely will be card lifting your idea. This is so soft and pretty! The vellum is something I have to try. Another amazing card, Joni! You rock, girl! So soft and elegant! Love your creative design! Gorgeous! Love the layered vellum and the soft colours. oh.my.gosh!!! love, love, love your card... absolutely stunning! Joni this is stunning! This is an absolute perfection! Yes! I enjoyed your card and how you made it. A true masterpiece! Soooooo BEAUTIFUL Joni! This card is breathtaking. Joni, Those vellum leaves are stunning! Beautiful card! Beautiful card, love the gold thank you. Unbelievably gorgeous Joni… You are a superstar! So very elegant! You are so gifted! Nicely done. I love how the vellum turned out! Gorgeous! This is so soft and dreamy, and drop dead gorgeous. I love it. So soft yet so striking! I am loving this one! Great job! This card is breathtaking, Joni. The less saturated colors along with the vellum are soft and lovely. They pair perfectly with the gold foil. I would have never thought to do pink flowers! Your card is so beautiful! I love it! Joni this is exactly why you are getting scooped up by all the Design Teams!! This is so beautiful and a brilliant technique! Wow, this is so gorgeous! Well done. What beautiful, delicate leaves! A gorgeous card! Sigh! Such a gorgeous translucency to the pink pink leaves. This is genius at work Joni. It's little wonder that you're in high demand for DT opportunities, because you are one outstanding, talented, awe-inspiring creator of works of art. This card: masterpiece of delight, with the soft pink flowers, the vellum leaves, the stitching. Your entire design makes be sooo happy! LOVE this! Totally stunning! Love this card. Stunning Joni!! I love your layers of colour then softened with the vellum!! Great idea to mask the card base to allow room for the gorgeous gold sentiment!! The stitching is great too. All-round gorgeous!!! Oh my, what a gorgeous take on this challenge! I'm thinking I need to practice masking and also start using that vellum I've been hoarding. Love this! Just amazing! This is one fantastic card! What a gorgeous card Joni! Love how you created the floral background....simply gorgeous! 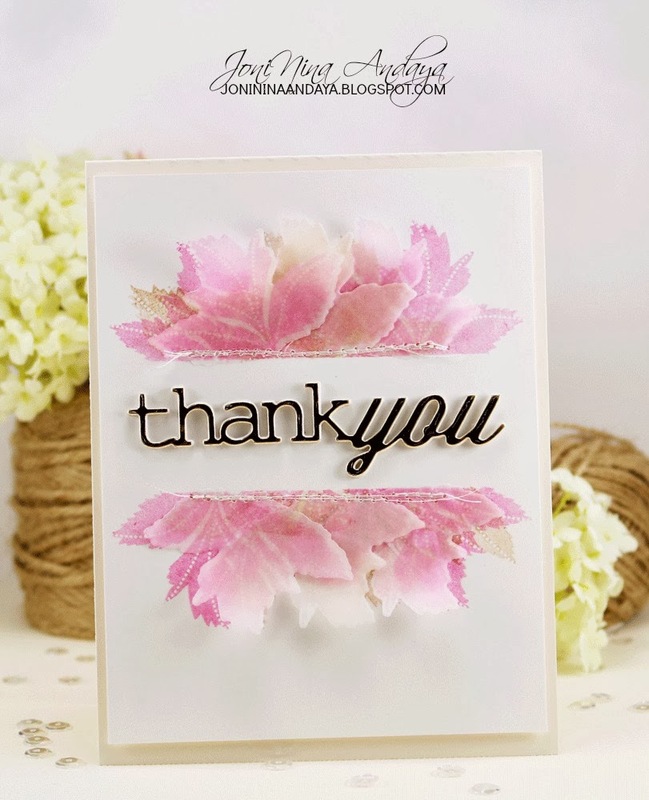 Spectacular use of vellum ... love that you have pink leaves instead of the more expected pink flowers. Your sewing adds such a nice, finishing touch too! Absolutely beautiful! I love the layered die cuts that everyone is doing these days it really helps make them pop without the dimensional adhesive. WOW! This is so BEAUTIFUL! I LOVE it!!! Wow this is so beautiful Joni. Just stunning. Wow!!! I mean really, WOW! The pink leaves sewn together look like peonies, my favorite flower. I love this. 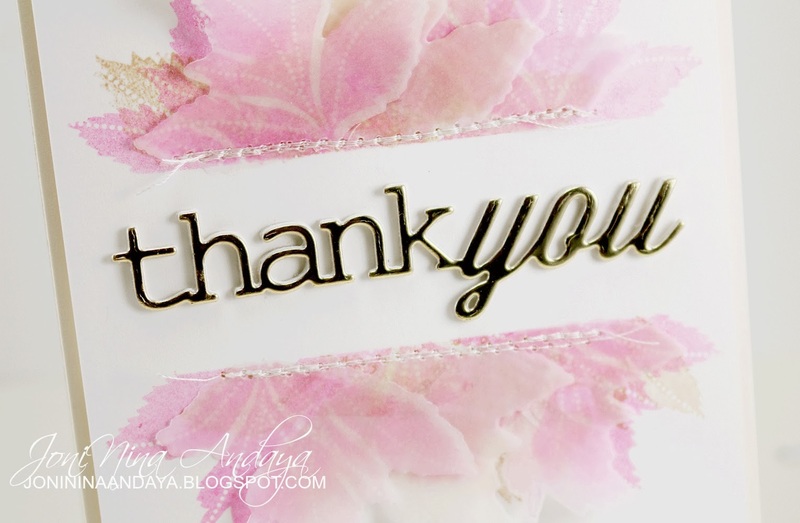 Beautiful - love the softer colors & the gold thank you! Wow wow wow! This is soooooooooo gorgeous!! LOVING those layers and the colors!!!!! This is absolutely breath taking! Wow! Your card is simply stunning! Wow! This just blows me away. It's absolutely stunning. This is one gorgeous card! Beauty-full. I'm loving all the vellum around cardmaking land. So yummy. This is so pretty!! I love it. Looks like the flowers are suspended. What a great job! WOW!! This is absolutely stunning!! What a gorgeous card in every way! The stitching on the pink leaves looks wonderful! Very lovely work!! This IS a BEAUTY1 Love your take Joni!!! Beautiful card Joni. Love the soft look of your card. The stitched vellum leaves look wonderful... also love the gold greeting. A-MA-ZING!!! Such a striking design! Wow Joni, this is sooo amazing! I love the vellum leaves! This is pretty spectacular, Joni! This is so pretty! I love every bit of it! THIS. IS. STUNNING. Absolutely LOVE the vellum, and that raised gold foil sentiment. SO classy, and just plain beautiful. Thanks for sharing!!! This is down right heavenly!!!! You are one amazing designer!!! Your leaves are gorgeous! so soft and lovely - and the gold die cut sentiment is the perfect accent for them! What a gorgeous, stunning creation!!!! WOWSA!!!!! WOW!!!! I don't think anything else really needs to be said... just wow! so beautiful, so fresh and elegant! Pure eye-candy for sure! wow!! Oh, so pretty, Joni! I love the airy feel and the gold sentiment is perfect! This card is absolutely breathtaking! This card is gorgeous! Love the vellum layers. Love this beuty, the colours, velum...everything, just stunning! © 2012 - 2018 Joni Nina Andaya. All contents, including text, photographs, and design works of Joni Nina Andaya. It is shared solely for personal inspiration and may not be copied for publications or contest submissions. Thank You! 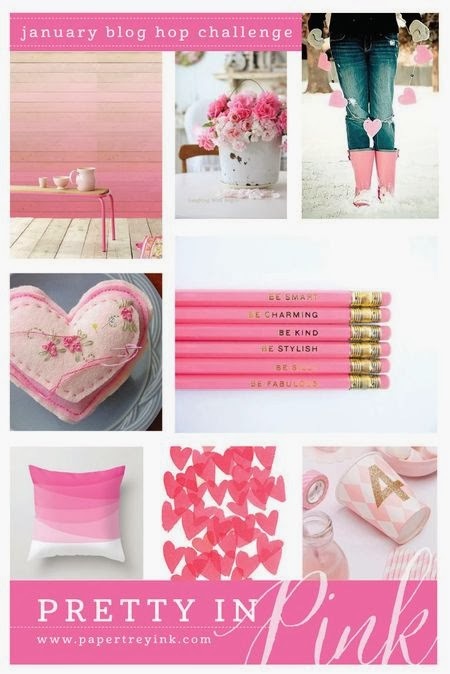 Visit Joninina's profile on Pinterest.